Jean Szilva, left, an F-35 opponent, in an animated discussion with supporter Tony Augostino. The Winooski residents were among the more than 50 who spoke before city council Monday. After two hours of public discussion overwhelmingly opposed to basing F-35s in Vermont, it remained unclear how the Winooski City Council will vote on the issue — or whether it will submit additional comments to the Air Force before a July 15 deadline for public feedback. The council delayed any action until Wednesday after hearing from more than 50 Winooski residents, only five of whom voiced explicit support for the basing. The vast majority said the warplanes, which would replace F-16s currently based at Vermont Air National Guard base at Burlington International Airport, threatens health and quality of life in the city. Winooski resident and activist Eileen Andreoli spoke to the council alongside a sign she made using a quote from the Air Force's most recen Draft Environmental Impact Statement. 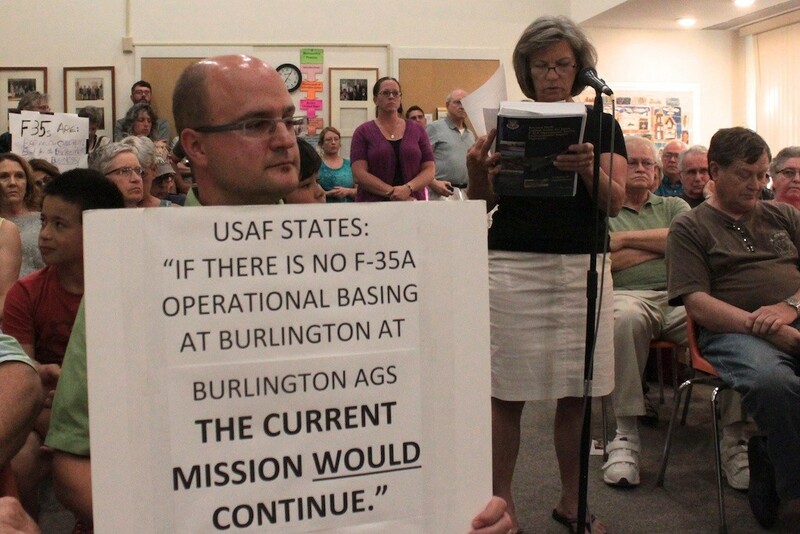 Even as Winooski residents testified, the South Burlington City Council was voting Monday evening to reverse a previous vote and officially support basing F-35s at BTV, over the objections of many city residents. Arica Bronz, who co-owns a duplex in Winooski and has children in JFK Elementary School, told the council she was extremely happy to have her children in the school system, but wouldn’t accept the change. Another resident, Dan Treinis, also said he would leave Winooski if the jets were based at BTV. Many others were vehemently against the F-35s and encouraged the City Council to send a strong message to the Air Force on their behalf. Resident Greg Premo said he worried the value of his home would fall with the increased noise from the new jets. “I urge you not to be a laissez-faire city council,” he said to a panel of three city councilors and Mayor Michael O’Brien. Councilor John Little was unable to attend Monday's meeting due to illness. While opponents cited reduced property values, public health impacts, and concerns about interruptions at school from jet noise, advocates for the F-35s said the noise was a small price to pay for the freedoms Americans enjoy. Tony Augostino, left, arrives at the Winooski City Council chambers with Fred Cota. 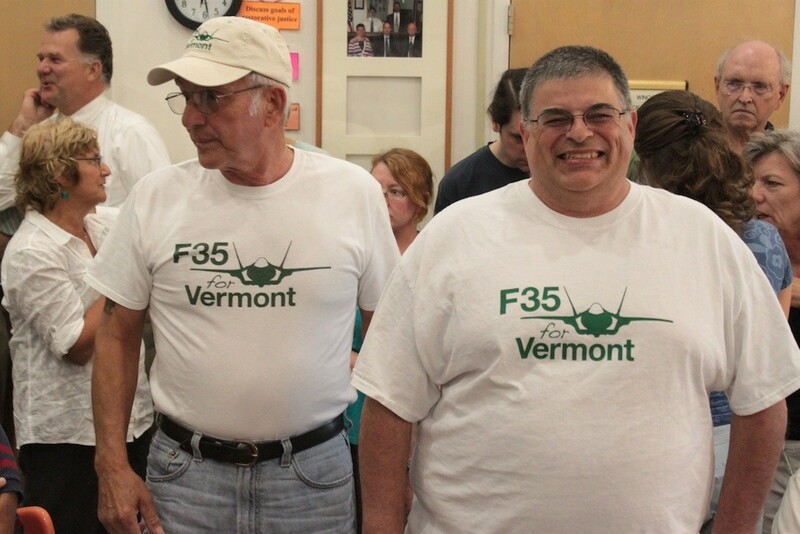 Tony Augostino, a lifelong Winooski resident who came to the meeting wearing an “F-35s for Vermont” T-shirt and matching hat, said the United States’ air superiority was a choice Vermonters should be proud of. “We’d probably all be speaking German” if the U.S. hadn’t invested in its military before World War II, Augostino said. Cota suggested Winooski residents concerned about noise refocus their efforts. “As far as the noise quality in town, if the people in this town spent as much time trying to get rid of the boombox cars, that might help," he said. 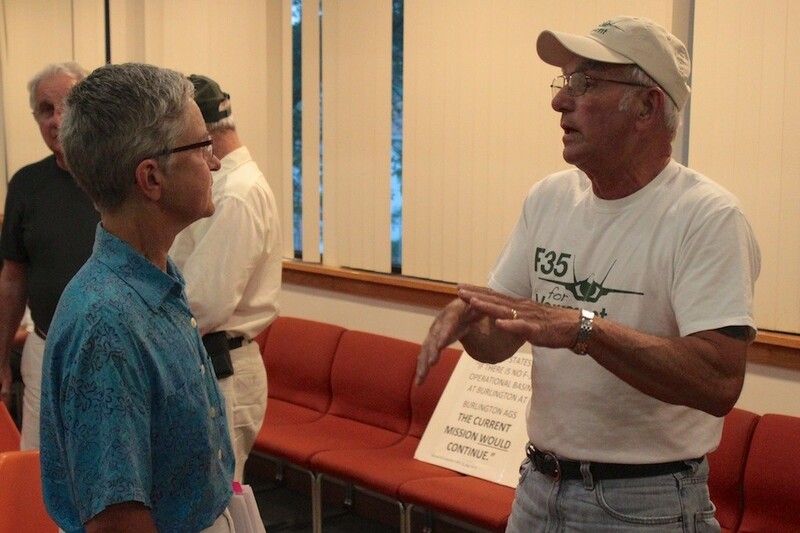 Though F-35 opponents outnumbered supporters by nearly 10 to one, the council seemed split on the issue. O’Brien said his experience hearing flights of F-16s and F-35s at Eglin Air Force Base in Florida made him think Winooski could tolerate the new, louder warplanes. O’Brien said he would be satisfied without the council choosing sides in the debate. Last summer, the council submitted questions to the Air Force about the economic impact F-35s would have on Winooski and the selection process that made Burlington a preferred location over other bases. The city also reuqested the Air Force take steps to mitigate noise levels over Winooski should the F-35 come. With the third councilor in attendance, Sally Tipson, strongly in favor of the F-35, it appears the body may come to a tie if they vote on Wednesday and Little is still unable to attend. City Manager Katherine “Deac” Decarreau, said she thought the body would likely come to some sort of agreement on Wednesday, but was unsure what it would be. In the case of a tie, she said, the council’s default position would be to issue no further comment. “I am absolutely, 100 percent, positively sure beyond a shadow of a doubt that I have no idea what’s going to happen,” she said.